Find all types of wonderful spots to go dog sledding in PA. Go dog sledding in Pennsylvania, so that you, your family, and friends can make the best of the winter. Dog Sledding and Dog Carting in PA! From December through February, Arctic Paws offers dog sled training tours on snow-covered trails, located on the golf courses of the Inn at Pocono Manor. 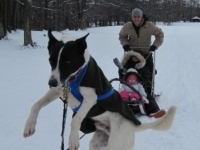 Learn to mush or ride as a passenger in the back of the dog sled. During the hour-long tour you'll get to participate in dog sled training, meet and learn about the Huskies, take photos of the Huskies, ride on the sled, and follow on the sled pulled by a guide with a snowmobile. All guests must arrive 30 minutes before tour time. If you plan on visiting in non-winter months, Arctic Paws also offers dog carting.